Quick, Qualitative & On Time Service – Houston water damage restoration or hurricane damage specialists inspect the problem immediately. We complete our jobs on time, and also cross check with customers to ensure that everything has been done appropriately. This way, the customers have peace of mind and satisfaction. Proper Assessment Of The Issue – Specialists provide a professional assessment of the damages to you. They first determine which services are going to be required for the complete restoration, then they confirm with you the scope of the services for the particular damage. Use Of Efficient Equipment – Water damage repair services use powerful equipment with fast blowers to dry water and prevent further water damage. 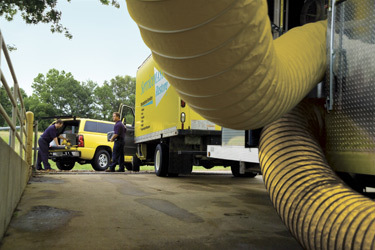 A Complete Clean Up – Houston water damage services generally make sure that a total cleanup is done, and the bad odors caused by mildew and mold are also removed with the help of ozone restoration. Best Services – Restoration teams for Houston flood damage give the best possible service and extra focus on water extraction and cleaning up damage from pipe bursts, sewer disinfection, hot water heater damage, etc. Concentration On Drying – A well-skilled Houston water damage repair team will always focus on drying out the areas including corners, walls, and furnishings, to prevent growth of bacterial mold and mildew which occurs due to the presence of moisture. Availability: Look for the professional water damage repair company whose services are available to you round-the-clock, 24 hours a day, 365 days a year. Immediate action: Locate the company which can take action quickly and wisely to lessen the negative effects of water damage. Certification Check: Hire the professional and skilled water damage restoration teams who are certified and are mindful of safety standards and procedures. There are many flood damage professional organizations and agencies in the Houston area which can provide cleaning and restoration services. However, the next time a disaster occurs, call ServiceMaster Advantage, the most trusted Houston water damage restoration service company.